I’ve been travelling and working overseas for the last wee while which has left me with precious little time, energy or even inclination to write. Truth be told, business class hotels are remarkably dour places to be, no matter how impressive the star rating. Come the late evening one simply loiters aimlessly in one’s room, knowing that you face another conversationally stilted car journey with a locally-hired, if perfectly nice, driver in the morning (there is only so much obligatory after-work socialising one can put up with, even when the host company is paying for it). Fortunately my recent accommodation was in a Continental city too stunning for words, from architecture to art, though my Celtic blood struggled with the oppressive heat of Mitteleuropa. Thank the gods for a rainy Saturday night back in the City of the Hurdle Ford! Meanwhile across the Irish Sea the Brexit controversy continues to rumble away in the UK, dragging both the Conservative and Labour parties into turmoil. Though Britain’s calamity may be Ireland’s opportunity it is is hard to see how this one will play out for our island nation. This is especially true given the supine nature of our political classes, from Fine Gael to the Greens. Watching establishment TDanna lining up to voice opposition to the holding of a democratic vote on the reunification of our country, watching some contemplate – with precious little sign of genuine perturbation – the foreign imposition of a new border in the north-east in preference to the righting of a great historic wrong, has been stomach turning. One unlikely source for analysis can be found in the celebratory if uncertain thoughts of Peter Hitchens, the right-wing UK journalist and brother of the formerly more famous Hitchens’ sibling, Christoper. Writing for the American religio-political news and current affairs website, First Things, he deals with Ireland’s British problem and the case for a Greater England version of the Irish republican slogan and party name, sinn féin, frequently if erroneously translated as “ourselves alone”. “By voting narrowly to leave the European Union, the theoretically United Kingdom of Great Britain and Northern Ireland has had only half a revolution this week. The second half may well sink into the swamps of compromise and inertia, which stretch in every direction. In the remaining British corner of Ireland, supposedly dominated by ultra-British Protestant Unionists, a clear majority, almost 56 percent, voted for continued subjection to rule from Brussels, capital of the European Union. Northern Ireland (as few on the mainland grasp) has been since 1998 a conditional and partial member of the United Kingdom. This is part of the peace agreement Britain made with the Irish Republican Army and its political front-men in Sinn Fein. The national flag, the Union Jack, can only be flown on official buildings at certain limited times. The Crown of St. Edward, symbol of lawful authority in these islands, has been removed from police badges. And at any time a single, irreversible plebiscite may be called, to transfer this odd, anomalous territory to the sovereignty of the Irish Republic. Martin McGuinness, the hardest man in Sinn Fein, is calling for such a poll. He may well get it, and if the province votes for Dublin rule it will at least spare the new non-E.U. Britain from having to maintain and enforce the wriggling, largely unmarked 310-mile border with E.U. Ireland. In truth, this would be almost impossible, leaving a back door into the U.K. through which illegal migrants could reach Britain through Ireland. Those who wanted to get out (and I am one of them) are going to have to accept that independence will not mean a return to the lost days of Imperial London, but will probably mean acceptance that England (with tiny Wales at her side) is on her own again for the first time in more than four hundred years. There are many in Ireland who would also relish the English going it alone if it spelled an end to the anachronistic remnant of London’s first and last colony on our island. Speaking of which, occasional writer, Faha, presents a detailed examination of the EU referendum results in the constituencies of the Six Counties for Bangordub’s psephological blog. Long-story-short, there is hope and optimism in plentiful supply for those who are brave enough to dream of a better tomorrow. “O wise men, riddle me this: what if the dream come true? As usual, Hitchin’s see’s everything through his English upper middle class distorting mirror.As someone with no roots in Ireland, or any great experience of it’s problems, he , like others of His kind, pontificates about matters that he knows little about, or cares for. That having been said, His alarm bells are ringing, and with good cause. The “Loss” of Northern Ireland would be a last humiliation for the tattered remains of the British Empire, is the clear yet unspoken thought behind his views. Never mind the war, with its huge casualties, it’s death squads, atrocities, and much else, or the near millennium endured occupation of someone else’s country. (In the formerly vast British Empire, one could easily misplace a country or two, and lose sight of them). Now, He, and others like Him, are being forced to face bleak reality. It is, for England, Sinn Feinn time. The downfall. The last act, as the Sun finally sets on the last few fragments of the British Empire. Sigh. He sounds a bit like a German, lamenting their losses on the Eastern Front, with no thought of the carnage for Russians that entailed. I think they call it short nearsightedness. He sounds almost bewildered. Shame. Rather more worrying actually: if UK – with or without Scotland – gets rid of Northern Ireland it can treat Ireland as another foreign country, There’s been hostility to the Irish in the UK for allegedly voting “Remain” in Ireland’s onterests: what’ll it be like when it will be practical to refuse admission to or deport Irish citizens? Plunkett was definitely better as a martyr than as a poet. …and Pearse was even better as a martyr than a poet! I thought Martin McGuinness was bff with Elizabeth (Saxe-Coburg) Windsor? Surely he would never upset such a special friendship? One should never bite the hand that feeds? But then perhaps the break-up of the UK is exactly what the alchemical doctor ordered. Reducing things down to their constituent parts in order to build them back into something entirely new. But what happens if the South votes against reunification? Classic Mac – classic ! The Brexit referendum proved that you can’t count on the people to make a sensible choice. Cameron learned that the hard way. Tho in this case I’m not sure which of the choices is the sensible one 😀 . If England loses its Northern Irish Pale, they will console themselves that an overseas island has been reunited. Most English people have little knowledge or interest in Ireland. Would they have shown the same indifference had Bloody Sunday happened in Manchester for example? Their real fear is losing the Northern part of “their” island. Can they share it with a pro EU Celtic neighbour? A “foreign” capital city on their soil? I doubt it. Ireland must be reunited. However who would the Unionists vote for? Their present parties would be irrelevent (morally and intellectually they are already), so who would they vote for? More support for Fine Gael perhaps? This sentence ‘This is especially true given the supine nature of our political classes, from Fine Gael to the Greens’ is absolutely priceless. It’s exactly that. They might very well end up alone. No NI, no Scotland. It will be like the Eighties, when the US had Ronald Reagan, Bob Hope, and Johnny Cash, and Merry Ol’ England had the whore in No. 10, no hope, and no cash. 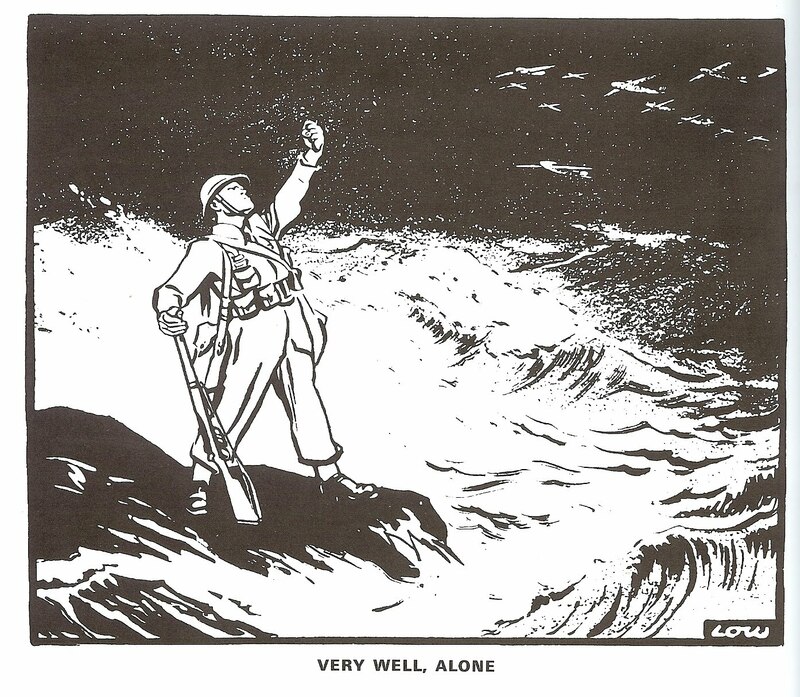 ‘Very well, alone then’ features in a loyalist postcard from WWI.